Hello Linux Geeksters. 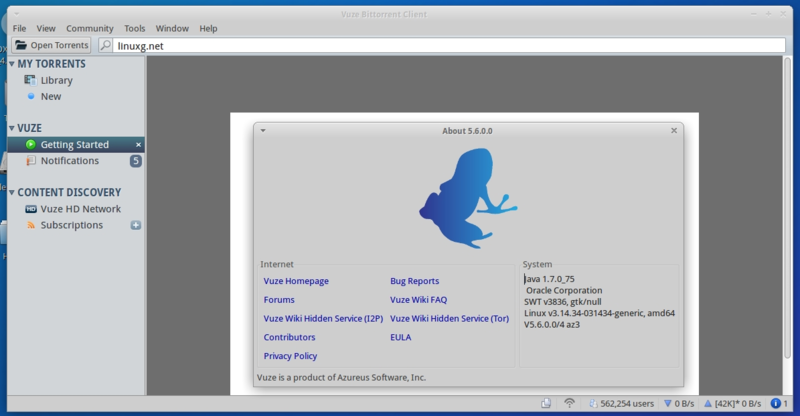 As you may know, Vuze (ex Azureus), is a BitTorrent client with the normal functions of such a program: multiple downloads, queuing, prioritizing files, start, stop seeding options. The latest version available is Vuze 5.6.0, which has been recently released, coming with the below changes, new features and bug-fixes. In this article I will show you how to install Vuze 5.6.0 on the most popular Linux systems, including Ubuntu, Linux Mint, Pinguy OS, Elementary OS, LXLE, Linux Lite, Deepin, Peppermint, Debian, SparkyLinux, Fedora, CentOS, OpenSUSE, Mageia, OpenMandriva, Gentoo, Arch Linux and Manjaro.